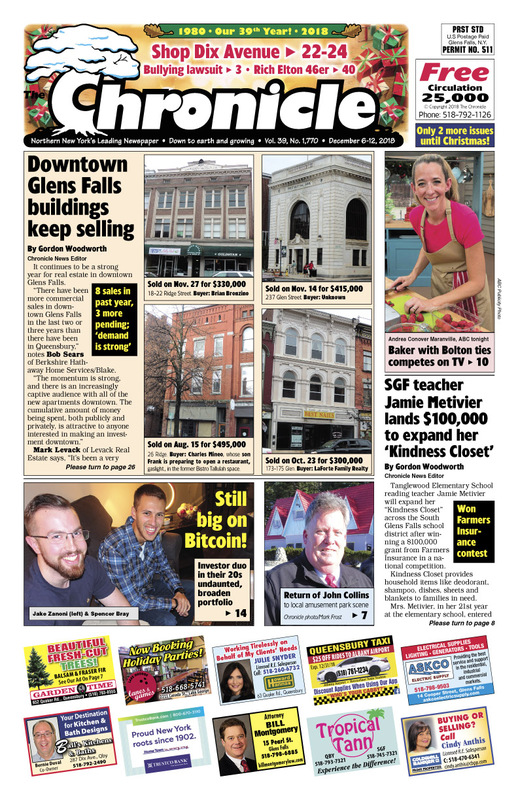 Our ‘Buy Local’ Gift Ideas | Downtown Glens Falls buildings keep selling. Baker with Bolton ties competes on TV. SGF teacher Jamie Metivier lands $100,000 to expand her ‘Kindness Closet’. Still big on Bitcoin! Return of John Collins to local amusement park scene. Jimmer, wife Whitney expecting son in April. Mother of girl attacked in SGF school files notice to sue it. So many holiday events! Pages of real estate listings… Find your dream home! Concerts, comedy, shows… The Chronicle always has the region’s best Arts & Entertainment section!